When spending a lot of time in the car while on the job, the Deluxe Car Seat Organizer from Uncle Mike's is just the solution needed to create an efficient and organized mobile work station. The front of the caddy features storage for writing instruments, business cards, cell phones as well as a zippered compartment for other small odds and ends. 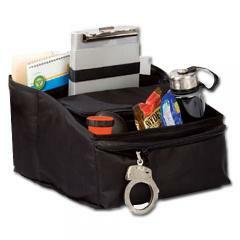 The middle of the organizer integrates a cooler that zips closed along three sides. Uncle Mike's includes a filing section at the rear for storing important papers, documents and forms. The Deluxe organizer fits onto car seats and secures using straps that can be tucked in for a neat and clean look in vehicles. Convenient organizer for front seat. Helps keep forms and equipment handy. Seat attachment could be better designed. There is an adjustable strap that is setup like a bag designed to be carried on the shoulder. Given the design of this organizer shoulder carry is impractical (and unnecessary). The strap would be much more useful if it had a buckle included and was stitched on facing the rear of the organizer (rather than the top). This would allow the strap to be secured around the seatback easier. Overall a good piece that could use some thoughtful redesign. Really like it, doesn't take up much room and has more room then expected.